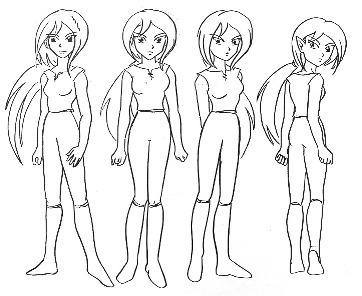 In your comic, try drawing characters with different body types. When drawing men, you should practice drawing short skinny men, big tall men, muscular young men, old wrinkly men; don't forget to do the same with women! Drawing the same character and just changing the hairstyle and costume might be easier for you, but not for your reader! Your reader needs to be able to tell your characters apart. Here you can see three body types and one child type to try. Always draw the whole character and then add the costume afterwards, to avoid anatomy mistakes. Type 1: Muscular based on Nani from Lilo and Stitch. Type 2: Rounded based on Ranma from Ranma 1/2. Type 3: Athletic based on Kotori from X/1999. 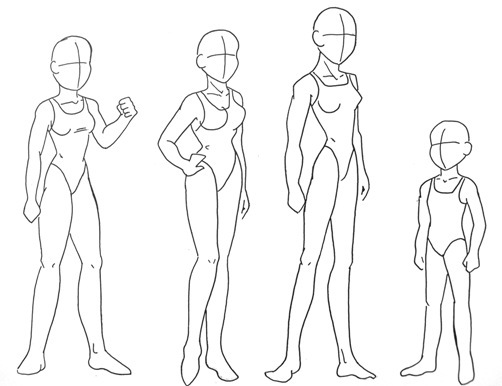 Now that you've practiced drawing different body TYPES, it's time to try different body ANGLES! 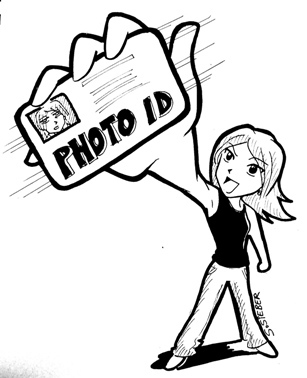 Until you can draw your character from the front, the back, and 3/4 view (slightly turned), she isn't ready to put in your comic! Why spend a lot of time erasing and re-drawing on your final comic page -- if you draw her from a few different angles beforehand, it will be much easier! In Manga, face close-ups are often front views, while full-body shots are most often 3/4 views -- because it is more 'actiony' (looks action-packed even if the character is just standing there). Back views are used in fight scenes, or anytime you want to show both the character and what she is looking at. Also use back views when your character is running away or waving goodbye. Try it! When drawing your character from above or below, remember this simple rule: closer parts are bigger, parts that are farther away are smaller. If a person is standing with one hand close to your face, that hand will look huge because it is right in front of your eyes. If the person's other hand is stretched back, it will appear smaller because it is farther away. Look at these examples from artists to see what that looks like in practice.